St. Johns Landing Estates community in Jacksonville, Florida. St. Johns Landing Estates is an upscale boating neighborhood with a private boat ramp that provides direct access to the southern shore of the St. Johns River. Located on Reed Island Drive in Fort Caroline, St. Johns Landing Estates is less than 10 miles east of downtown Jacksonville on the southern shore of the St. Johns River. The area is perfect for hiking, exploring, boating and fishing, and residents can enjoy wonderful river views. 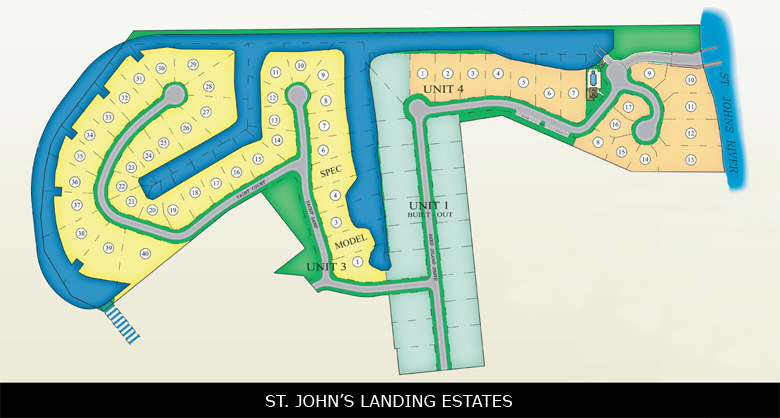 St. Johns Landing Estates is also convenient to the Beaches, Regency Mall and Jacksonville International Airport. The community features recreation center, community pool and private boat ramp. See site map. Community builders are Builtmore Builders and Watson Custom Home Builders.